James Crandall of Greenville shared some railroad memories Saturday with Sheila Glavine of Greenville (right), who attended the railroad workers' reunion and tour of the Greenville Junction Depot on Saturday. Also in the photo is Crandall's wife, Brenda, wearing the hat her husband wore as station manager at the depot. 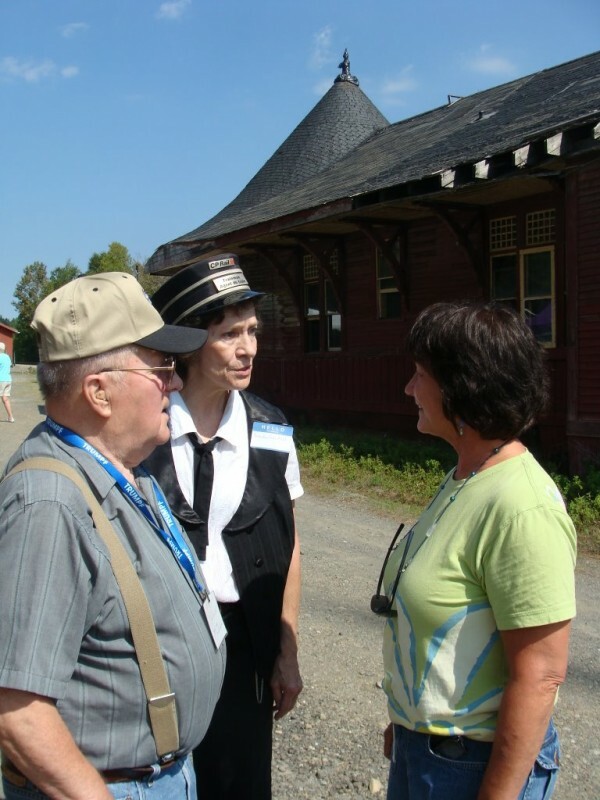 Visitors from throughout New England attended a railroad workers' reunion and tour of the Greenville Junction Depot on Saturday. The event was held to raise funds to help save the building. Patty Ferland (right) of The Friends of the Greenville Junction Depot explained to Steve and Kathy Ryder of Shirley on Saturday how the ticket office in the depot operated. The Ryders were among those who attended a railroad workers' reunion and tour of the depot on Saturday. 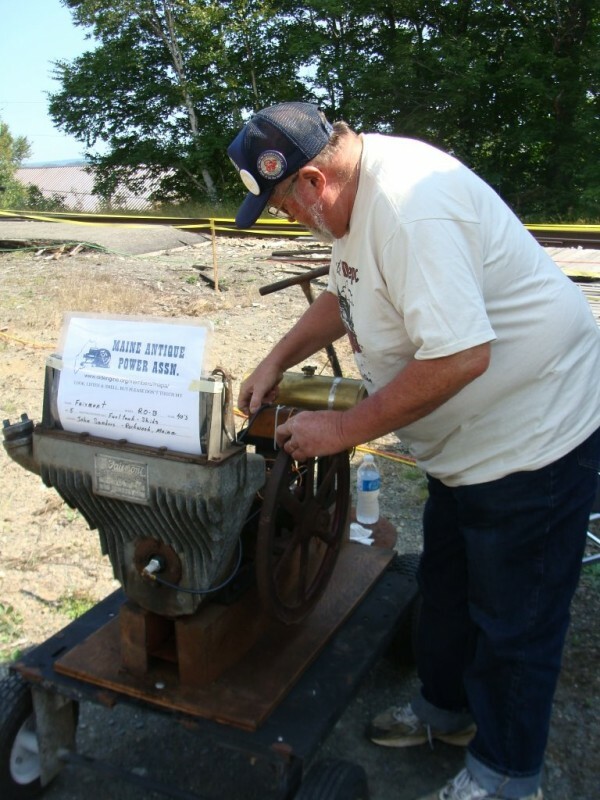 John Sanders of Rockwood displayed a Fairmont Railcar engine he owns Saturday during The Friends of the Greenville Junction Depot's railroad workers' reunion and tour. Visitors toured a room in the Greenville Junction Depot on Saturday as part of a fundraising campaign to save the historic buildling. GREENVILLE, Maine — Happy to share their memories of working on the railroad, James Crandall, 82, of Greenville and Cecil Miller, 95, of Milo chatted with just about anyone who would listen Saturday during a railroad workers’ reunion at the Greenville Junction Depot. The pair were among several former Canadian Pacific Railroad workers who attended the reunion, which included a tour of the depot. The event was part of a fund-raising event to save the depot. The Friends of the Greenville Junction Depot are trying to raise $500,000 to move the depot with its witch’s hat across Route 15 onto state-owned land, where it would be rehabilitated and turned into a community center. Crandall, who was the last station master at the depot, said he served from 1965 to 1973 and worked for the railroad for about 40 years. He was promoted to mobile supervisor in 1974 and had to travel throughout the state as the railroad’s ombudsman. 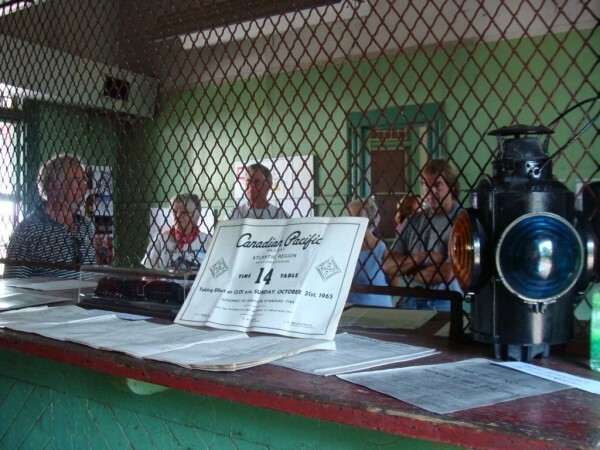 As station master, he took tickets and handled the paperwork for freight and train orders. “I’m pleased they are trying to save the depot,” Crandall said Saturday. 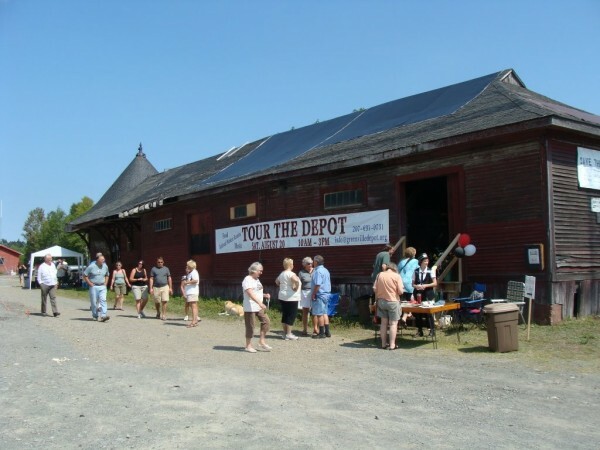 The Maine Historic Preservation Society in 2008 listed the depot, with its unusual architecture, as one of the most endangered historical buildings in the state. The first section of the depot was built in 1889 by the Canadian Pacific Railroad, the same year the first passenger train arrived in Greenville. The railroad added on to the depot over the next 30 years, visitors were told during the tour. Inside the depot are displays of model trains, uniforms that were worn by the station master and other artifacts. 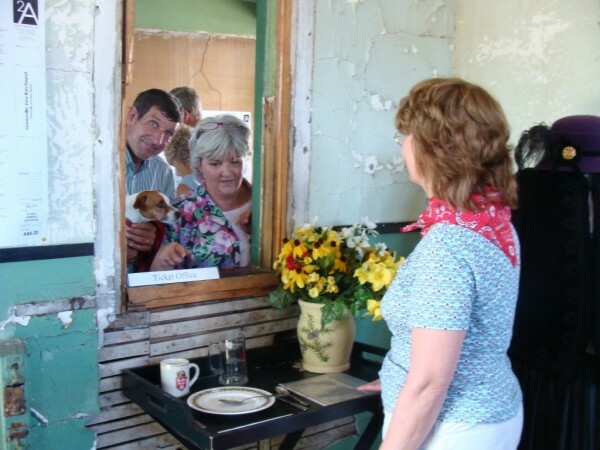 But it was the memories of the railroad and the history of the depot that captivated most. One bitterly cold winter night, Crandall said he spotted an old car parked outside the depot. The car had a windshield but no passenger’s- or driver’s-side windows. Six Indians from New Brunswick who had arrived early to work on the river drive were sound asleep inside, he recalled. They had no place to stay until the ice went out of the lake. “I went out and tucked my head in the window and said hey,” he recalled. “I said why don’t you guys come inside where it is warm.” They quickly got out of the vehicle, thanked Crandall and ended up staying inside the station for a few days. Crandall said he often brought food up for the Indians who arrived to work on the drive. He even loaned them money and the first thing the Indians did when they came through the station on their return home was to pay him back, Crandall noted. “There’s a lot of history behind it,” Crandall said of the depot. He said both his father and his grandfather were engineers on the train. At one time, he said there were six Crandalls, including his sister, who worked for the railroad. Crandall said he had hoped to become an engineer but was 16 at the time and wasn’t able to get the job. In the meantime, he went to work as a train operator and station agent and worked at train stations in Onawa and Harvey, New Brunswick, before working in Greenville. Miller, who also is pleased an effort is under way to save the depot, said he began work for the railroad at the age of 15 and spent much of his 44 years with the railroad as an engineer. Like Crandall, most of Miller’s family were railroad people, including his father, grandfather, uncles and cousins. Crandall said it was nice to share the history so that others will remember in the future. “This has been a great event,” he said.